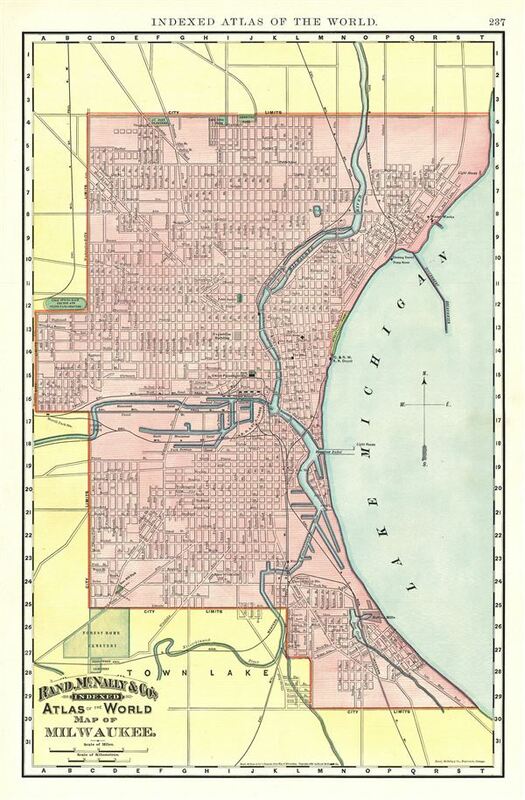 A fine 1892 map or plan of the city of Milwaukee, Wisconsin, issued by the Rand McNally and Company. It covers the entire city in great detail from St. John Cemetery to Greenwood Cemetery. It identifies individual streets and buildings, including City Hall, Exposition Building, Court House, Post Office, etc. Throughout, the map notes several parks, cemeteries, creeks, rivers, and a host of other topographical features. This map was issued as plate no. 237 in the 1893 edition of Rand McNally and Company's Indexed Atlas of the World- possibly the finest atlas Rand McNally ever issued. Rumsey 3565.122 (1897 edition). Philips (atlases) 1026 (1898 edition).